We love adding fruit to desserts, but did you ever think to add veggies? 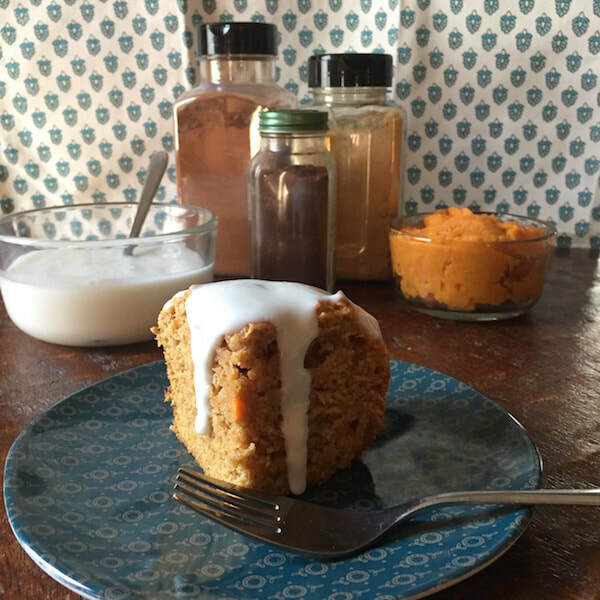 This cake uses sweet potatoes and whole wheat flour to make it a bit healthier than your regular cake. Preheat oven to 350°F. Line the bottom of an 8x8 inch square pan with parchment paper and then butter the paper and sides of the pan (a 9x9 inch pan works fine too). Prick potatoes with a fork and microwave on high for 5 minutes, or until soft. Peel cooled sweet potatoes and mash until very smooth. Measure 1 ½ packed cups from sweet potato mash and set aside. In a large bowl, beat butter and brown sugar together with an electric mixer until light and fluffy. Add oil, vanilla and eggs, and beat until just combined. Mix in sweet potato puree. Whisk flour, baking powder, baking soda, salt and spices together in a medium bowl. Stir dry ingredients into wet ingredients until they are just mixed in. Do not over mix. Spread batter in prepared pan, and bake about 35 to 40 minutes. Let cake rest in pan for 5 minutes on a cooling rack, then invert onto cooling rack, and let cool completely. For the frosting: Whisk all ingredients until they become a bit thick. Place in the fridge to thicken even more (at least 30 minutes). Spread on the prepared cake. Serve at room temperature cut into squares.